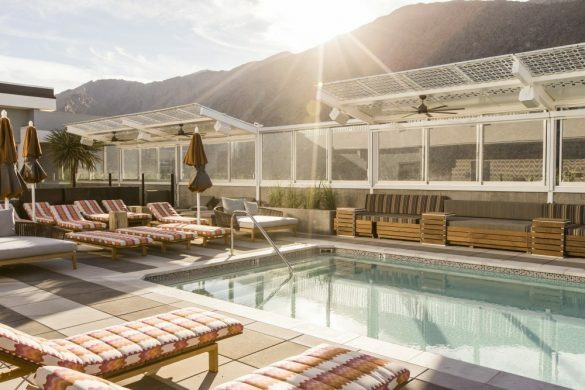 An ethereal desert beauty permeates every experience at Kimpton Rowan Palm Springs Hotel, where urban enchantments meet epic scenery. The 153 soothing, spacious guestrooms and suites offer a restorative retreat after heart-thumping adventures on rugged trails or in the lively nightlife scenes. At the rooftop pool and bar, pair brilliant sunsets with masterful cocktails. Dine at one of our two chef-driven restaurants featuring seasonal, shareable small plates made from fresh, local ingredients. From vista points like our refreshing rooftop deck or the two-story cinematic window in the lobby, the views are stunning and unsurpassed. Embrace our desert dreamland.